Care and welfare are perhaps the two most fundamental aspects associated with rescued animals under human care. Although simple in connotation, the word ‘CARE’ itself could entail highly complex measures to fulfil an animal’s needs. ‘Caring’ comes naturally to all us and it is nothing but the expression of our concern for another individual and the willingness to strive for its betterment. Fortunately for us, all of us either have or will at some point in our lives, be involved in the care of another living being, being a rescued wild animal, your own pet or another human being. Whatever the age or species of the animal in concern, success lies in following, what I would like to call, the Magic Formula: Food, Warmth, Shelter & Security, Hygiene and Enrichment. As simple as the formula may seem to be, it may just as complicated to provide for the needs of different species. Knowledge of the species too is important in being able to fulfil the above necessities. It is universally acknowledged that an animal in its natural conditions would have access to all the resources essential to for it to be able to fend for itself and fulfil its fundamental needs. The moment an animal is placed into captivity, it loses its ability to fend for itself simply because of a lack of opportunity to do so. By restricting its movements and the availability of resources (often simply due to unavailability), we deprive it of its most basic needs. We are therefore obliged to provide for the animal’s needs – this is essential for its survival, wellbeing and timely release. Food is one of the most primary needs of any living organism. Intake of food is meant to fulfil two purposes – energy intake to complete our required tasks & nutrient (vitamins, minerals, etc.) intake for smooth functioning of the organs. Our bodies are also designed to compensate for deficiencies by consuming larger quantities of foods containing the desired nutrients, but an animal in captivity simply does not have the opportunity to do so. Each species will have different requirements at different stages of their life. Food offered to any animal must always be wholesome, palatable and varied. Giving the animal a varied diet keeps its diet from becoming monotonous, prevents dependency on any particular foods and ensures the intake of adequate nutrients. Rather than being forced to consume what is given, giving a variety of foods in generous quantities gives them the freedom to choose what they like best and consume what the body requires the most. Adequate vitamins and supplements must be added to the diets of growing young animals and animals that aren’t getting complete nutrition from their food. The availability to salt licks and calcium slabs in the enclosures are always beneficial for the animals. Depending upon the species, supplements may be offered in different forms. Baby animals on milk feeds (or milk substitutes) often require additional supplements like probiotics and digestive enzymes to help them break down the lactose content and digest the feed – this can be for crucial for its survival and wellbeing. All or most of the food in the last stage of rehabilitation must be gathered from the wild. The proportion of cultivated foods must be slowly reduced and stopped well before release. This is extremely vital for animals that will be released as they must get used to the foods they are likely to find in the wild and not yearn for cultivated (human) foods. In addition to food, fresh, clean drinking water must be provided for every animal every day. Water bowls and troughs must be thoroughly cleaned every single day. Please refer to our page on Nutritional Basics for more information. A primary need of any living being is the availability of a source of warmth. While most wild animals will either crawl into nooks and crannies to shelter from the elements, they all come out during sunlit hours and bask in the warmth of the sun. Where adequate exposure to the sun cannot be achieved, warmth may be provided in the form of artificial lighting. The enclosures must allow different intensities of light so the animal may choose the intensity it desires and move away completely if it wishes to. Dens and nest boxes are equally important in providing the animal the opportunity to retreat and shelter from harsh winds and rains. Depending on the severity of the cold, the hide and nest boxes may even be insulated to retain warmth. The hides must all be waterproof and robust enough to last through at least a few rough seasons. Repairs must be done at regular intervals to ensure they remain warm and waterproof. There must be provisions for additional warmth for young and sick animals as their thermoregulation will be either underdeveloped or compromised. Warmth may be provided by means of blankets, heating lamps, hot water bottles, external heaters or heat pads, insulated chambers or any other safe and convenient means. Additional warmth may slowly be discontinued upon growth and healing. Artificial heating is normally not required for healthy sub-adult and adult animals (esp. if intended to release) as their bodies must be attuned to the temperature variations and ready to adapt to the natural sources of warmth in the wild. Please refer to our page on Housing for more information. While shelter is a purely physical need, security is often an emotional state of wellbeing. Although it is closely tied with the way an animal is housed, ‘Security’ is a lot more complex than simply providing shelter. Shelter is also closely tied with ‘Warmth’, as seen above, but is inadequate in providing warmth and hence the need to provide additional warmth. Housing must always be sheltered, secure and quiet. Housing must provide shelter from the elements and have a place for the animals to retreat into. Although urban species are fairly accustomed to human movements and sounds, all other species are extremely fearful of humans and exposing them to constant anthropogenic noise will only cause them much discomfort. Predators and prey must never be housed in close quarters. All animals have an innate fear of anything that can cause it harm. This fear elicits a ‘flea’ response on perception of the threat. Fear can be expressed by both predators and prey. It is obvious that any prey, be it small or large, animal will be fearful of any predator. Similarly, predators may also be scared of larger prey that can cause it harm. Constant exposure to such a threatening situation and the inability to escape only leads to absolute anxiety. Cubs of large cats, for example, are often trampled intentionally by elephants. Housing such cubs with constant exposure to elephants and their trumpeting may cause him severe anxiety and distress. A feeling of security is crucial for an animal’s wellbeing. Animals that don’t feel secure will be ill at ease and under constant emotional stress. This may eventually make the animal extremely nervous and possibly aggressive. The simplest way of providing an adult animal security is by allowing it to retreat and hide away from unwanted human presence. Forcing an animal to be exposed to humans, esp. at close distances will only cause it unnecessary stress. Every enclosure MUST have a hide or a place for the animal to retreat, unless the animal needs to be observed at close quarters for medical or other lifesaving procedures. In all other cases where an animal needs to be observed non-intrusive methods like one-way glass, hidden cameras or opportunistic observations during feeding are desirable as they refrain from causing any distress to the animal. Young animals, especially of species that live in groups, must always be housed with other youngsters of the same species. Such species are inherently social and need others to develop their social skills. The presence of other conspecifics not only adds to the feeling of security but also encourages the learning and expression of behaviors that are natural and helpful for the species, strengthens communication within the species and facilitates the process of rehabilitation. Grouping them also has the advantage to releasing them at the same time as a group, thereby enhancing the chances of survival of each of the individuals within the group. 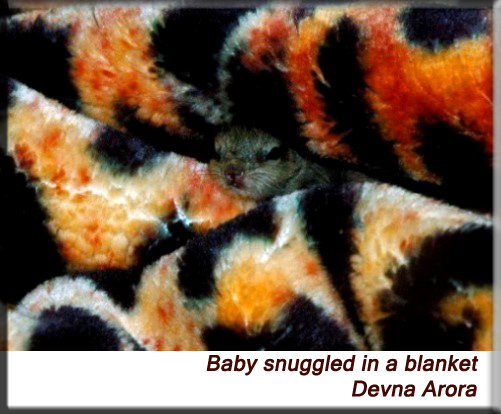 It is natural for young animals to seek comfort from it mother/parents. When scared or unsure, they run to the ‘mother figure’ for security. Older animals in the groups often fill in this gap and provide security to the younger ones. 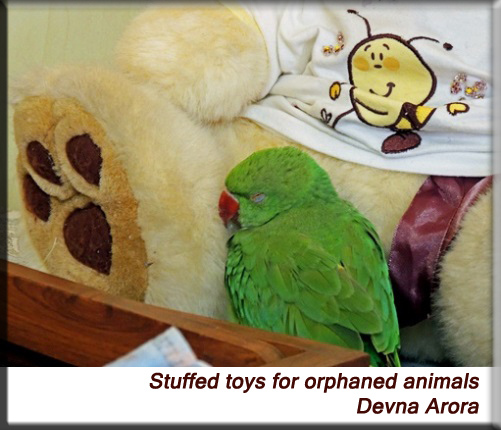 If no animal of the same species are available, offering a stuffed toy during the hand-raising phase is also extremely helpful for both mammals and birds. They not only enjoy the soft warm feeling of the toy but cling to it for safety when they are scared – fulfilling part of the need of having other animals around. It must be noted that ‘feeding’ also offers security. Young animals may therefore be bottle-fed (as opposed to feeding in a bowl) until weaning. This also makes handling easier (where desirable) as the youngster responds better to someone it is dependent on. Please refer to our pages on Orphaned Animals, Housing and Hand-raising for more information. Hygiene, especially during the hand-raising phase, is of utmost need and importance. Lack of hygiene only results in ill health and disease. Any feeding apparatus must be sterilized after every feed – carelessness at even a single feed can result in fatal infections. Ill health impedes the development of the young and can set them back during the crucial period of growth. Older animals too require absolute care in terms of hygiene but they may not require sterilization in the way that young animals do. All enclosures must be cleaned off animals droppings unless housing coprophagous species. Appropriate cleaning routines must be followed for coprophagous animals. Older animals may have defecation areas – places where they prefer to defecate and thereby mark their territories but young animals will defecate anywhere and may frequently soil their own bedding. Young animals will also pass copious amounts of urine. If left in wet, soaked bedding, they will only catch a chill. Bedding for the youngsters must therefore be checked at least three to four times daily and replaced promptly. Our own personal hygiene too is of great importance when handling young animals. Young animals must be kept in sterilized zones. Hands must be thoroughly washed before handling them. If other animals are handled and enclosures entered before entering the sterilized zone, it may be advisable to change your clothes and shoes as well. Young animals have underdeveloped immune systems and it is quite unnecessary to expose them to the various bacteria and pathogens that may prevail in other enclosures. Young animals that have not fed on their mother’s milk are further deprived of anti-bodies and require utmost care in terms of hygiene. Animals devote a significant amount of time foraging for food in wild. A sizable proportion of this time is spent in finding and extracting the food rather than actually consuming it. 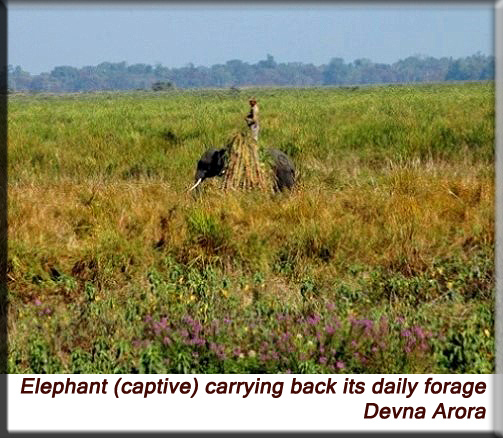 Finding and extracting food involves immense physical and mental activity – the animal has to travel to the food, find it and then extract it. This activity also entails a learning procedure where the animal learns to avoid unpleasant or unsatisfying experiences, getting bitten by ants around a fruit or biting into raw or rotten fruit for example, and learns to recognize preferable foraging opportunities. They also have the opportunity to consume a wide variety of foods in the wild – this ensures the intake of different vitamins and minerals from the different foods. Animals in captivity do not have the opportunity to do so. They are provided food on a platter – all they have to do is ingest it. This involves little mental stimulation. They also do not need to move much and might not have ample space to do so anyways. The surroundings also become monotonous – it is the very the same thing they see every day. This often leads to stereotypic behaviors, esp. in long term captives. Animals must be provided with feeding and behavioural enrichment in captivity. This keeps them alert and in happy spirits and also encourages physical activity. Enrichment is also crucial for rehabilitation as animals that are to be released need to be extremely opportunistic – they need to both recognize and take advantage of all opportunities that come their way. 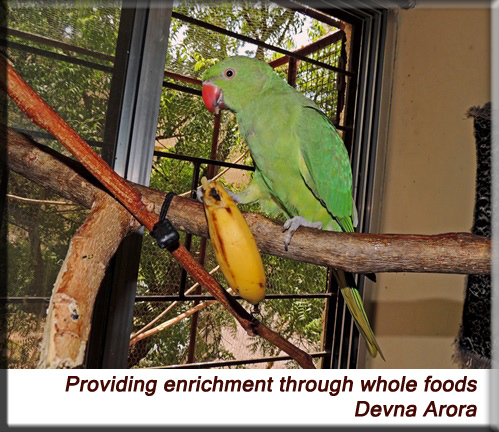 Enrichment can be provided by two interlinked means: feeding enrichment and behavioural enrichment and must involve a combination of simple and complex tasks. The simple tasks ensure that the animal will get some nutrition instantaneously whereas the complex ones ensure that the animal will spend substantial amount of energy and thought process on accomplishing the task. Shelled seeds and nuts for example can be easily ingested while offering those with the shells will require the animal to break through the shell and get to the seed. Whole fruits too require work to get to the sweet, pulpy part of the fruit. Hiding or hanging food in different places of the enclosure will also make the animals work for their food and involve greater time seeking rather than consuming the food. Please refer to our pages on Housing and Nutritional Basics for more information.